Hi, I am interested in your 1981 Jeep CJ 7 (stock #4712-ATL) listed on Autotrader for $26,995. I'd like to get more information about this vehicle and confirm its availability. With its sharp exterior looking nice and fresh and an eager V8 standing by under the hood to supply plenty of power, this 1981 Jeep CJ7 Renegade holds the promise of all kinds of fun - both on the asphalt and off. Its a sturdy and able SUV when the call of more rugged terrain beckons, but also offers nice, civilized road manners that make it well-suited for frequent driving. When Jeep introduced the CJ7 a few years before this 81 debuted, it marked a significant change of direction for the brand. Whereas previous editions of the CJ line were known mostly for their rugged dependability and off-road surefootedness, Jeep made a number of changes to markedly improve the CJ7s suitability for everyday motoring. Its nearly a foot longer than its predecessors for a more civilized ride on the highway and the modified cutouts at its sides can accommodate hinged doors. Sitting at just the right height to provide ample ground clearance without going overboard, this Renegade wears a very clean stock exterior. Its clad in black paint with a deep, appealing shine, accented by signature Renegade decals gracing the hood that look nice and sharp. Its a great looking ride in its open-air configuration and a bikini top is included to provide some shelter during less agreeable weather. Take a lap around the car and youll notice that the fender flares - so often the first area to show signs of both age or abuse - are in good shape, and the bumpers in front and back are level and unblemished. The thoroughly refurbished interior strikes a great balance, in that its overall look shows the spartan ruggedness fitting for a task oriented SUV like this, but provides plenty of comfort as well. Pretty much everything inside the doors is in great shape. Aftermarket black vinyl front buckets and rear bench seat take the place of the originals here and theyre looking very clean, bracketing a center console that sports the same condition. Rubber matting, as opposed to carpeting, lines the floor, an indication that this Jeep is meant for the most part to be about spirited off-roading. When you take your place in the drivers seat, with both the manual Hurst shifter and the lever activating the 4-wheel drive within easy reach, youll feel eminently ready for rough terrain, and the, clear functional gauges in the instrument cluster will keep you apprised of all essential motoring functions. The storage compartment in back is protected by spray in bedliner thats performed its protective duties well. The 360 cubic inch V8 now lurking beneath the hood with its chrome air cleaner and valve covers offers substantially more power than any of the original selections on the Jeep menu when this 81 came out and its running in top form, armed with a 4-barrel Edelbrock carb and intake, and an upgraded ignition system has been added to the mix to maximize spark. The engine pairs with a 4-speed manual transmission thats shifting smoothly and precisely, creating a driving experience youll actually look forward to, no matter the environment and the sidepipes add curb appeal and broadcast the powerplants rich exhaust tone very effectively. Power steering provides an ease of navigation that really comes in handy during driving in closer quarters, while front disc brakes help provide fade resistant stopping power. This classic mountain goat on wheels navigates terrain on 15 Bullet Hole wheels outfitted with substantial Goodyear Wrangler tires. 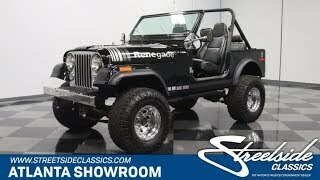 If youre looking for a sturdy SUV with both vintage appeal and plenty of power and capability, this 1981 Jeep CJ7 Renegade is definitely one to check out. Call today!